The PS/2 keyboard-and-mouse ports are designed to connect your keyboard and mouse. 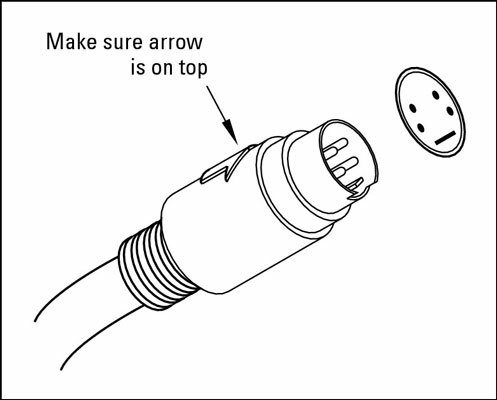 This figure illustrates the plug that fits in the keyboard and mouse ports. The keyboard and mouse use the same kind of ports (but don’t get them mixed up, or they won’t work). A PS/2 keyboard-and-mouse connector. Awesome sight, isn’t it? Each port is typically color-coded and marked with an icon (a keyboard for the keyboard and a mouse for the mouse — nothing confusing there) to indicate which piece of hardware gets connected where. Virtually all PC hardware manufacturers are turning to USB keyboards and USB mice. (Which is why USB is so important to the modern PC.) You don’t get any real advantage from using a USB keyboard or mouse over a PS/2 keyboard or mouse because you don’t really have to configure a PS/2 connection, and you’re not continually unplugging and reconnecting your keyboard and mouse.